In recent weeks we have appointed a number of new staff to the Customer Services Team in Information Services. Two of these roles are evening and weekend library assistants and four roles are Information Assistants. The Information Assistants work approximately 10 hours a week each in order to provide IT help and support in the library. 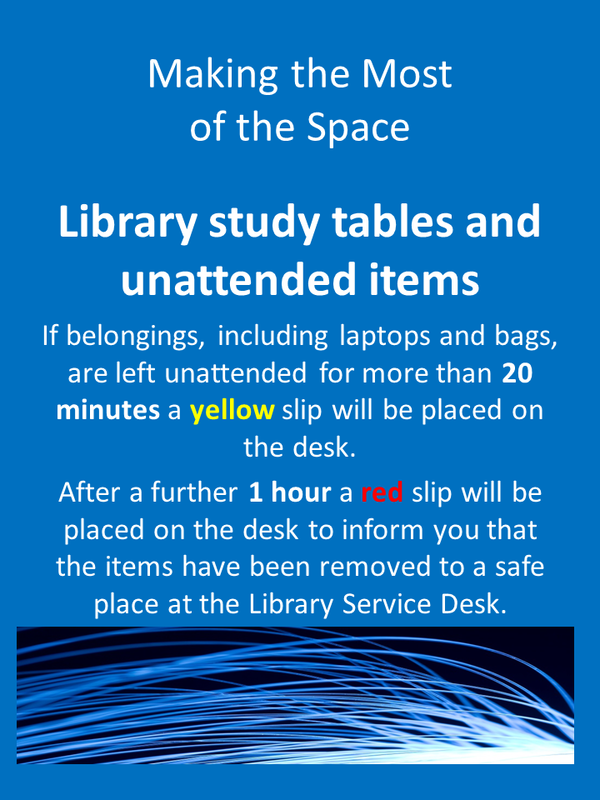 The duties include dealing with IT enquiries at the IS Lib Help-desk, on the library floors and occasionally by phone. The enquiries or issues have to be accurately logged and recorded. The Information Assistants are responsible for monitoring the printers/MFDs - filling them with paper, helping students to use them and troubleshooting faults. One more traditional library task they do is shelving, tidying and weeding. An important part of their role is to monitor the library space and its usage. It is important that they provide relevant support for students at the time and place that it is needed. As with any new roles, there is a testing and reviewing component but so far it is working out alright. The Information Assistants all possess some customer service skills, some IT skills and some experience of working in a library or educational environment. The challenge during these first few weeks is to ensure that balance is correct and that the people have the training they need to carry out the role effectively. Our Library Self Service system and other new Information Services developments were 'opened' by the University Principal on the 13th September. It was an opportunity to show off the new services that are available. As well as the self issue / return book kiosks, there are staff service cards which are like ID cards but can be used for printing via the MFDs and accessing secure buildings. 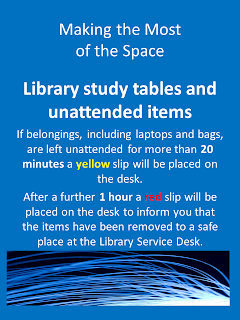 Also there has been changes to the library space to make more room for study spaces. Week 1 Semester 1 - successfully completed. It has been a very busy week with lots of students and lots of things happening. I like the first week of term because it is new and exciting and it's what you work towards for weeks and months. I was particularly looking forward to it as I have not seen the library or help desk or any part of the University when it is full of students as I only started in my post in June. The self service book issue and return system worked well - most of the issues we'd had during August have been resolved and its been fairly robust. We need to encourage students to use it and generally raise the profile of the facility, but all in all it's been very positive. The changes to the circulation from the library service desk have also gone smoothly although we now need to look at workflow and what changes need to be made to how processes are carried out. The footfall, students accessing the library space, has been high but we don't have the exact figures yet from the smart gate software but it will be interesting to compare with previous years. I'm more interested in the 'queue' and looking at ways that we can queue manage and intervene and direct in order to improve the student experience. The IT Helpdesk has been located in the library for the last two weeks as well as the Library IT Helpdesk and this has worked well. They have offered face to face, phone and email support. There has been high demand for IT help and this has been mainly run of the mill getting started and set up stuff rather than issues. Passwords, accessing emails and setting up wifi are the most common requests. It is interesting that although there are clear instructions on how to do these things on the website, students still want to come along and ask in person. There have been many students wanting to connect to the wifi via phones and tablets and it has been challenging when the phone language settings are not English - one of my greatest achievements this week has been setting up android phones in Spanish. We have had two new evening and weekend library assistants starting this last week and I've provided some training for them. It's been useful to see all the evening staff as they start their shifts as I'd not had a chance to meet them during the summer vacation. We interviewed for Information Assistants last Monday and had some suitable applicants that we've offered the roles to. They are going to be starting as soon as possible. In other news, we spent time evaluating tenders for security firms for our 24/7 opening later in the year. On Friday a member of library staff was retiring after 16 years and there was a lovely shared lunch and get together. So far, so good - looking forward to week 2. Tomorrow is the first day of Freshers Week. The first day for new students is always exciting when you work in a school, college or university. It's the beginning of a busy year and it's good to get things started. Tomorrow is the first day of our library self service facility including the self service kiosks - I'm looking forward to seeing how it goes. I think it's as ready as it can be, it's never possible to have everything perfect but we're good to go. Today's exciting event at work was that one of the self service kiosks has arrived. The engineer from Bibliotheca came to do the site visit and look at the entrance exit gates and the book security antennae. Various questions arose about where and how they are powered and dataed. Then the kiosk was unpacked and set up and we were shown how it worked. It looks great. It's not ready to use yet as we have to configure certain things and try out different features and functions. Also very importantly the book and journal stock has to be RFID tagged. It's all very interesting and I'm looking forward to it being operational. 1. Service Desk Institute Conference at Edgbaston, Birmingham. 2. ALT-S SIG event at Glasgow Caledonian University. During the time that I've been at 'normal' work, I've continued to meet up with as many people as possible who are members of my team or members of the surrounding teams within the Information Services Directorate. It takes time but it is time well spent. It is very useful to me and helps to build up a picture of how everything works - a bit like mapping the landscape. It shows where people are physically placed and also the interactions between them. It's interesting to hear how people see their role and hopefully shows that I am interested in them and what they do. As far as my team, the Customer Services Team, are concerned, I've spoken to most of them to find out what they do. I still need people to show me some of the processes and systems but I've got an overview. I don't need to know all the nitty gritty yet and I'm making some assumptions based on what a typical library service desk would do. The IT helpdesk is part of my remit from July so I've started to liaise and interact with them and get to know how it works. The surrounding teams basically consist of User Services which are second line services and also include Subject Librarians. It's interesting talking to them and thinking how we are going to refer enquiries. Resources are another part of the Directorate and this includes acquisitions, cataloging and library systems. So the next (first) step to developing the team is to give us an identity as the 'Customer Services' team. Also to set up weekly team meetings which will provide a focal point for communication and discussion. There are a lot of exciting changes happening not least a library self service system which is going to be installed this summer. They are coming to do the site visit on Monday and may bring a test kiosk for us to try out. I started my new job as Customer Services Manager, Information Services at Heriot Watt University of 5th June. So far so good - I've enjoyed it and have made some progress or at least found out a bit about the place and the people. The first day was taken up to a great extent with an HEA STEM Social Media Workshop (more about that in a separate blog post) which was a useful way of meeting various people but not having to absorb lots of information straight away about everything new. My role involves managing the library service desk and the IT helpdesk and the staff involved in these areas - basically everything that is front line / first line - the customer / student interface. The library and IT services at Heriot Watt are converged into the Information Services directorate. I like this set up - I think it is really important that the library is connected to the technology and technical aspects and provision in order to get the support that is needed. Also vice versa, the customer service of IT helpdesks and IT support can often be improved by collaborating with library service desk staff who are experienced at answering enquiries. My line manager has been great - very supportive and informative and I know how difficult it is when you're busy to find time for new staff starting. My strategy has been to talk to as many people as possible to find out what they do and what happens in the team / directorate. I started with the library service desk staff and just asked them to tell me anything about what they do and about what happens on a day to day basis or anything that they think would be of interest to me. I explained that I'm looking for an overview to start building up a picture of what it's all about. A lot of the staff have been at the University for a long time and are very experienced. I was pleased to hear that they are quite keen on change but would like to know more about what is planned and more communication - so this is a fairly typical situation. From the point of view of the helpdesk, I think this is the same opinion although I'm not unaware that lots of these changes are going to be easier said than done but I'm hopeful. I like finding out how places operate their service desks - it's a bit like a puzzle where all of the pieces are similar at different institutions but are different shapes and sizes in the individual jigsaws. The other things I've done are to attend some meetings - there was a meeting about the new self service system that's going to be implemented in the library over the summer - very exciting. I attended a session by one of the librarians from HW Borders Campus which was very informative and interesting for me because of the FE aspects. The campus is 'shared' with Borders College and HW supply the library service. I went along to an Information Skills Group Meeting which I think is a subset or greater set of the Subject Librarians Group. They were discussing the sessions that they are going to be running next semester for students and staff. They have a wide variety of sessions and these are popular and well attended. They also mentioned induction sessions / library essentials sessions. Although this won't be under my remit, it was good to sit in and listen to what they have planned. I've started to explore the campus - I wasn't sure how I would like a campus university as I've always studied at and worked at city centre universities but I quite like it. It's like a village or mini town with everything there. The grounds are beautiful and my office has a window that looks out onto the gardens - so far, very good. Last week the teaching year and exams finished at the University of Edinburgh and therefore the Student Information Points (SIPs) moved to holiday opening hours. This meant that the SIP at Kings Buildings closed for the summer and the one in the Main Library in George Square changed it's opening hours to 11.00 - 15.00 Monday to Friday. The other thing that happened was that I left my role as Student Information Points Manager as I am taking up a new role at Heriot Watt University. This year has been a very interesting and challenging year. I've enjoyed working at the University of Edinburgh, it is a great university and it is vast - there is no way of understanding how big and diverse it is until you become part of it. Then you realise that it is all encompassing and also devolved. It is also very tolerant and very interesting. I wanted to work in a University and that was the reason for moving from an FE College and it has definitely fulfilled that criteria. There are some beautiful historic buildings as well as some very quirky and odd buildings. The office for the SIPs is in Buccleuch Place, in an attic flat, with 92 steps to the top and although I'm sure it has done me good I'm not going to miss the climb. I have gained valuable experience of working in a project - not only working in a project but starting from the very beginning and setting up a service from scratch at the very beginning of a project. It has been interesting and challenging to implement and develop an enquiry service while still planning and deciding which direction it should move in. It's been good to have that opportunity to have a flexible approach and have targets that are not set in stone apart from, of course, delivering an effective service. It's very different, or at least I found it very different, from being embedded in the organisational structure of the institution. I enjoy and appreciate opportunities to work in a changing environment and manage change - the more situations that you are involved in then the easier it becomes to recognise that a particular tactic or strategy may work. Sometimes it is instinctive but as time goes on you react more efficiently to the situation - or at least I hope I do. As ever managing staff is the best thing and also the most difficult thing. It was great starting with a team who were all brand new i.e the job roles of everyone were new, no one knew each other and there wasn't any baggage. All of the SIP team are personable, clever and enthusiastic which was great. It takes time to establish a working team and in hindsight I would have spent more time building although perhaps there is no quick way and it has to evolve. It takes time to establish working practices and ways of doing things and prior experience counts. The job roles evolved differently than the initial job descriptions outlined and I think this is one of the key things about a new project - you have to adapt and change as you go along and fit to the demands of the service. The roles developed into more than an enquiry answering service and became a combination of customer support, campaigns/resource creating and also research and miniprojects. Being part of the project team, the Student Experience Project (of which the SIPs are one strand), has been brilliant - everyone has been funny, quirky, clever and mega efficient. 1. Setting up and maintaining a face to face enquiry service for students, staff and visitors at a number of locations. 4. Creating resources, paperbased and electronic, to provide information for students based on information collated from existing University information into more accessible and relevant formats. Also new information as and when needed. 5. Outreach activities which involved having a SIP presence at other parts of the University such as Edinburgh College of Art, the School of Education at Moray House, the Vet School at Easter Bush and the halls of residence at Pollock Halls. 6. Campaigns to raise awareness of the information / enquiry service and promoting an 'Ask us Anything' facility. 9. Planning for inductions, freshers week and other events and key dates in the academic year and student life cycle. There is more, day to day things and strategic things that I've learnt about and experienced, but for now thats it, time to move on. Campaigns are one of the initiatives that we've used to raise awareness of the Student Information Points and to advertise to students that we provide information. It has taken a bit of trial and error as it is quite a difficult concept to convey - that is, that the product you have is information about products and services. We did an Easter Egg campaign where we had a basket of plastic eggs and some contained USB memory sticks and some sweets or chocolate. It was a lucky dip and gave us the opportunity to engage with students and raise the profile of the service. Then we did a campaign where students could vote for a guide or publication that we would produce - they had to vote using ping pong balls for one of three options. The winning option was for 10 places for £10 to visit in Edinburgh. This was a very good way of using a visual prompt to engage students and was simple but effective. The most successful campaign that we've run is the Exam Locations Guide campaign. This was thought up by two of the SIP assistants at the end of last year for the December exams and then developed further and expanded for the May exams. 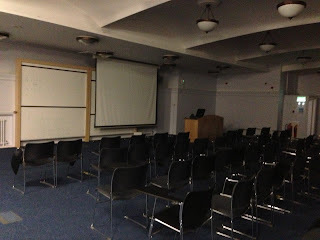 Exam locations are difficult for students because in a University such as Edinburgh the locations are widespread across the university and indeed the city. They are often in places students don't usually visit as they use the big halls not the usual lecture theatres or teaching rooms. There are quite a few university maps but none highlighting exam halls. So we produced a guide with a colour coded map and included other useful information. We also got various exam related items such as pens, stress balls, relaxation CDs, sweets etc. The guides plus the items were very popular and students appreciated the useful information at a potentially stressful time. This is a belated blog post about an event held in April. 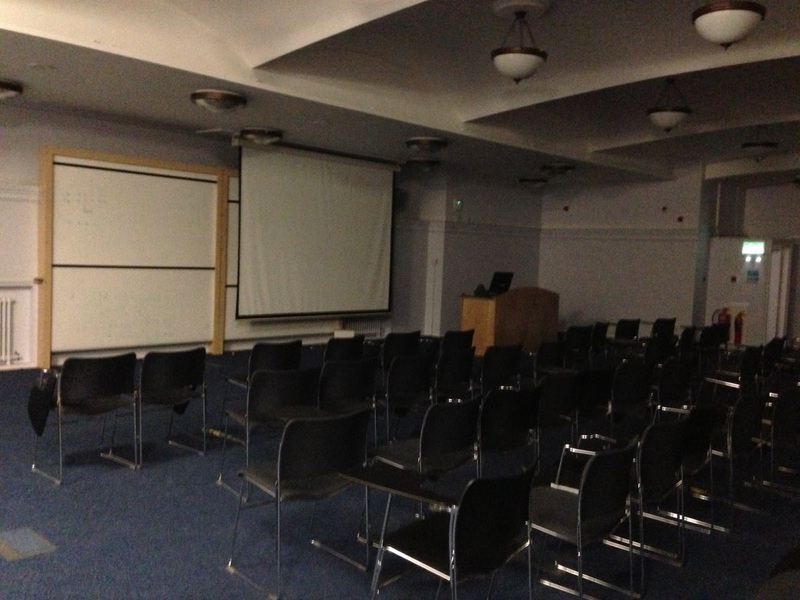 It was an event for staff at the University of Edinburgh and was held in South Hall, Pollock Halls. It was organised by the Induction Development Planning team who are part of the Student Experience Project. The event was attended by academic staff delivering induction sessions, School/College administrative and support staff organising and delivering events and support for new students, staff from central support services who organise Freshers Week events and support and Students / EUSA. The event was very well attended and there was a good mix of staff from the different areas. The aim was to share good practice and gain an understanding of what is happening across the University as far as Induction is concerned. It was also an opportunity to learn about the Induction strand of the project which is an important aspect for all those involved in the project in order to raise the profile of the work and collaboration that is taking place. The keynote speaker was Michelle Morgan who gave an insightful talk about successful University Inductions. It's very illuminating for staff at Edinburgh to see how it is done elsewhere and how important it is to have a co ordinated approach as well as preserving the more individualised approach. http://www.improvingthestudentexperience.com/student-practitioner-model/SEPM%20Books%20/table-of-contents/The rest of the day was split into sessions looking at good induction practice and also the challenges that are involved in enhancing the induction experience. Non traditional students in the School of Education who have a variety of access routes and require support throughout their course of study as there may not be others to talk to. Online Distance Learners of which 99% are part time with other commitments. Induction for them needs to be as early as possible and needs to focus on the technologies that they need to get started. The School of Law have a variety of Induction events and have a very focused approach with a director of student experience. The students receive a welcome pack, introductory lectures with tea and cake, careers advice from week one, LAW PALs peer support. Vetinerary Science students receive support around transition as it is very difficult to explain what it is going to be like as an udergraduate. They receive pre arrival support and have a bootcamp of study skills. The day was very interesting and useful. A short plenary was given by one of the Vice Principals who reinforced that for inductions to be successful students must be at the centre and must thrive. They must do the best they can, understand the system, expand their horizons and leave with skills they can describe. This is a very belated summary of the Student Information Points (SIPs) from when we began in August until the end of Semester 1 in December. It has been an interesting, exciting and challenging 5 months - a valuable experience for myself and the rest of the SIP team. We did a presentation event in November which went well and was a milestone for us as it enabled us to put down a marker at a certain point to say what we had achieved, or at least the progress we had made. The audience for this presentation was a cross section of staff from across the University including support / central services and also academic / schools. I presented a cut down but updated version of this presentation in the first week of this Semester and again it was good to 'mark' our progress. On a practical level the Student Information Points have been operational on a daily basis since the 10th September which was the first day of Freshers week. We've offered a face to face service and an online presence including the website and social media sites. The SIPs have offered an electronic communication service including email and text. We have been based at the Main Library in George Square and also in two places at Kings Buildings. We are constantly reviewing our locations especially at Kings Buildings to work out where is the best place for us to offer an accessible and useful information service for students. We've also done some Outreach which is when we have set up a 'mobile SIP desk' in buildings at other campuses of the University. These include the Edinburgh College of Art, Moray House - School of Education, Easter Bush - the School of Veterinary Studies. The SIP team have done an excellent job in collecting and collating information from across the University and as you are probably aware the University of Edinburgh is a vast and diverse place. This has been one of the crucial factors contributing to the success of the service and means that we can answer any question. We may not know the answer but the team know a great deal and know how to find it out if need be. An important part of collecting the information has been liaising with staff across the University in central services and in schools. This has been interesting and challenging and has included a lot of work by the team and myself at different levels to achieve this. We have liaised with individual staff and also through meetings, committees and groups. I don't think there is a set formula for building up these relationships, they are different in each area and some of the schools are very different to each other. Also as we are part of a bigger project it is different to being part of a department ourselves so this has had advantages and disadvantages. The logging and recording of enquiries has been valuable as it has given us the data we need to constantly review the service that we offer. It has also enabled us to give feedback about the sort of questions that students are asking and the sort of information that they need communicating to them. Most of our enquiries have been from students although some have been from visitors, potential students and also from staff. We are looking at ways of collecting the data so that we have more information about the type of enquirer as well as the type of enquiry. We have lots of plans for Semester 2. The Student Support Project, of which we are a strand, is growing so there are opportunities to collaborate with communications and with inductions. We are developing our web presence and looking at ways we can communicate about our service and also be a communication channel for other services. We're looking at what else we can offer in order to add 'substance' to the service and provide documentation that students need. We held a competition for students to design a logo for our posters and materials so we are hoping to use these ideas to update our brand and raise our profile.